Health Costs > How Much Does Rituxan Cost? How Much Does Rituxan Cost? Rituxan, the brand name of the drug rituximab, is used to treat non-Hodgkin lymphoma and chronic lymphocytic leukemia. The drug is also used to treat rheumatoid arthritis, microscopic polyangiitis or other autoimmune diseases such as lupus. Approved by the Federal Drug Administration in 1997, Rituxan, manufactured by Biogen and Genentech, works by killing the cancer cells and interfering with the immune system’s function. How much a Rituxan infusion cost? The cost of a Rituxan infusion will depend on your insurance coverage, the hospital you choose and additional treatment costs beyond the infusions. The average cost of one complete round of treatment, which would be two infusions, is about $20,000 to $25,000 or an average of $10,000 per infusion dose without health insurance. Your health insurance carrier, however, will cover the procedure as long as medically necessary, leaving you responsible for your co-pay and deductible. Lisa Emrich answered this very question on HealthCentral.com and said, of the six infusions she had so far, which was equivalent to three complete rounds of treatment, she was charged $11,288 to $18,544, but her insurance negotiated to pay $10,275 to $11,996. According to one response on RXList.com, she was charged $13,000 for her first infusion. ConsumersUnion.org, according to their study, claimed it cost the manufacturer $300 to make the drug, $3,500 for the hospital to buy it and $13,702 as the average patient charge, making the markup more than 1,065 percent. On rheumatoidarthritis.net, he showed off his insurance claim, showcasing the costs and coverage. According to the bill, the infusion clinic he used charged $8,690 for 1,000 mg of medicine. This didn’t include the costs of the nurse, the equipment or the other premedication drugs. Receiving eight infusions per year, the annual costs, without insurance, is close to $61,128, but thanks to Genentech, the manufacturer of the drug and his insurance company, the out of pocket costs were less than $800 per infusion. The cost averages mentioned above only include the cost estimates for the Rituxan infusion only. In many cases, the injection is used in a combination with other medicines, for example. 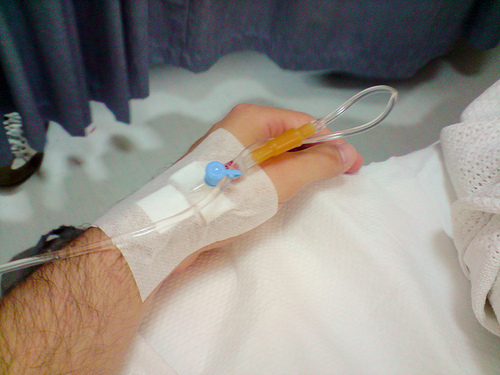 Even if the infusion is used on its own, there will be additional charges that often come from the facility and/or doctor who prescribed the infusion. If used together with other medications, then the costs will increase according to the medication prescribed. Rituxan is administered as a slow infusion via an IV by either a trained nurse or doctor inside of a medical facility or infusion center. The dosage and treatment will greatly depend on your medical condition and how you respond to the therapy. Common side effects, according to EverydayHealth.com, may include back pain, fatigue, headaches, night sweats, diarrhea, a runny nose and/or feeling anxious. Serious side effects can include an earache, fever, sinus pain, unusual bleeding, painful urination, chest tightness and/or swelling. Rituxan, even if you have insurance, may be able to help assist with the costs, offering up to $24,000 in benefits annually. Refer to the official financial assistance page to see if you qualify. I receive once dose Rituxan by infusion it took 6 hours in an outpatient setting and I couldn’t believe the Cost of $31,551.05 and I am supposed to get a second dose 2 weeks later which will be in two days. I don’t know yet was my insurance will pay, but no medication should cost that much. Is it liquid gold. I was told it would put me in remission if it does I guess it will be worth it. But I think either the hospital or the drug company are making way to much profit on a sick person health.